April 26, 2017: About 30 people inside of Robert Presley Detention Center and at least one in Southwest Detention Center in Riverside, CA have been on hunger strike since April 13, 2017. Jail administrators have yet to meet with the strikers to address their concerns. The Riverside County Jails’ conditions undermine the prisoners’/detainees’ rights and dignity. Reports from April 26, 2017 are that some women prisoners in Robert Presley Detention Center have joined in the hunger strike. They too have stopped eating. We will share more information as we learn it, reaching out for family members of those women. We expect there may be additional issues for the women prisoners that they are striking about. We will find out. Four people on hunger strike in Robert Presley Detention Center have passed out. Three of them have had trips to outside medical facilities. Riverside Sheriff’s Dept. runs the Robert Presley and has been retaliating, trying to intimidate the hunger strikers. For almost two weeks, they have not allowed family visits, and they limited phone access, cut off all commissary, and levied rules violations1 against the people on peaceful hunger strike. On April 26, Day 14 of the Hunger Strike, we learned that visits, telephone, and commissary have been restored and the rules violations withdrawn. Outside pressure stopped that retaliation! It is well past time for the Riverside Board of Supervisors and Sheriff’s Dept. to meet with the strikers and address the reasons for the strike- inhumane and needlessly restrictive policies! ⇒SHARE THIS UPDATE FAR AND WIDE. Encourage and help your organizations, churches, etc. to write a letter, too. Join a Rally on Monday, May 1st in support of the Hunger Strikers on their 17th day. More details will be out soon. Our Rally will be alongside the May Day Marches and Rallies honoring International Workers Day and Immigrant Rights Day. 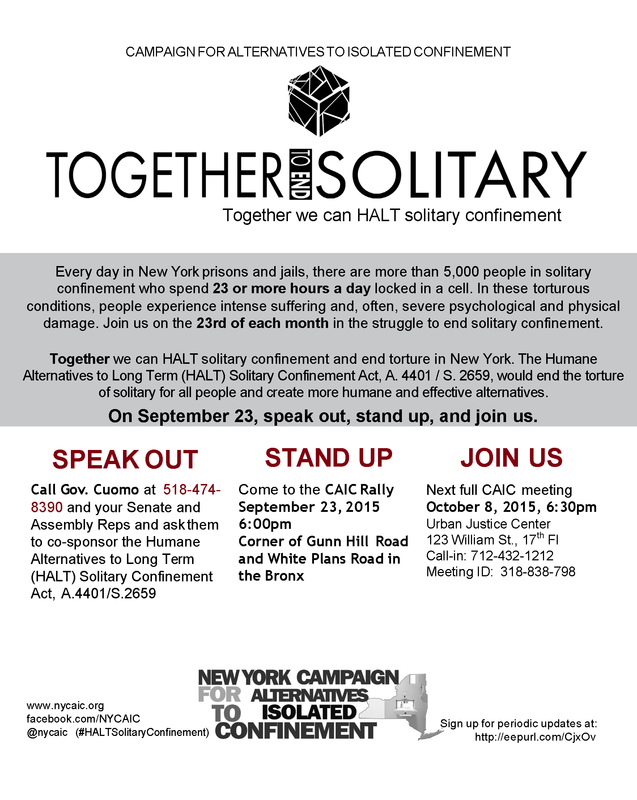 People in solitary confinement have been loudly awakened by guards every 30 minutes 24/7 since the night of August 2nd! Please help stop this sleep deprivation torture. On Nov 30th, the 119th day of interrupted sleep 48 times a day, about 20 people took part in an EMERGENCY PROTEST at CDCr headquarters in Sacramento to stop these so-called “security/welfare checks” being done every 30 minutes in the Pelican Bay SHU and other solitary units in CA prisons. Sleep deprivation is torture, and that is what these loud, intrusive checks are causing. For people in solitary cells 23-24 hours a day, the noise and disruption every 30 minutes is unavoidable, endless torture. 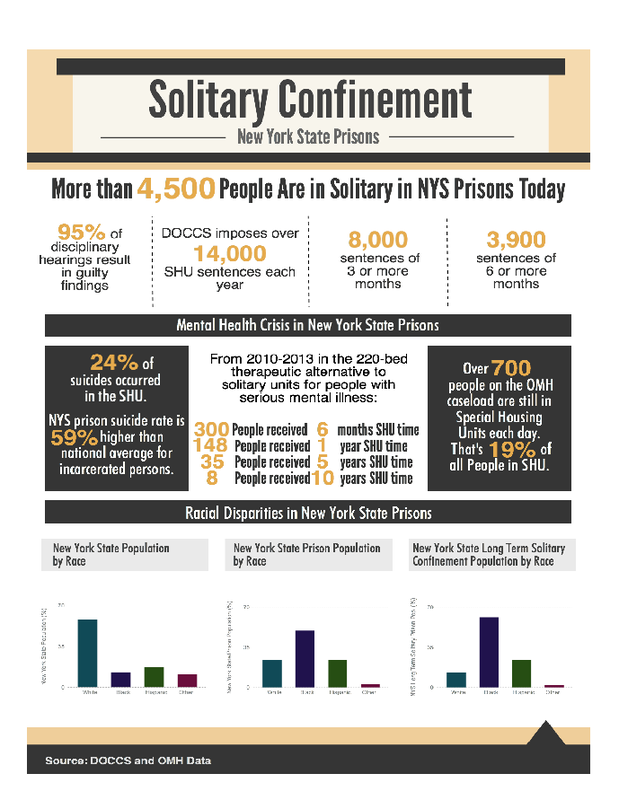 Prisoners are experiencing severe stress, weight loss, dizziness, nausea, headaches, eye problems, stomach and bowel problems, faintness, depression, and sped-up heart rates. They cannot concentrate, exercise, read, do legal work- the things that help them survive- and they can’t sleep! Stop the 30 minutes welfare checks in solitary confinement at Pelican Bay State Prison. Sleep Deprivation is Torture. Below are more photos from the Nov 30 EMERGENCY PROTEST at CDCr in Sacramento. And VIDEO here. 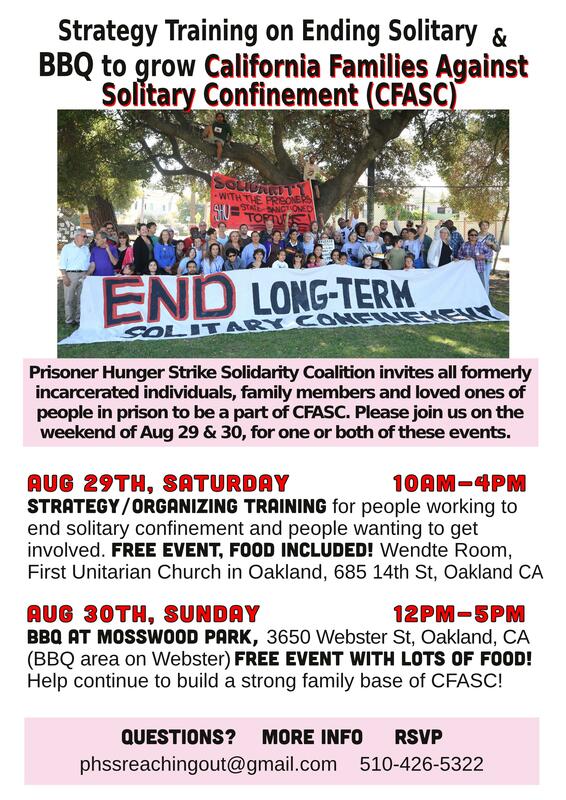 Join us in commemorating the suspension of the largest hunger strike in U.S. history – begun on July 8, 2013 by over 30,000 people. At great cost to their health, dozens of incarcerated people in CA fasted nonviolently for 60 days, ending on September 5, 2013. 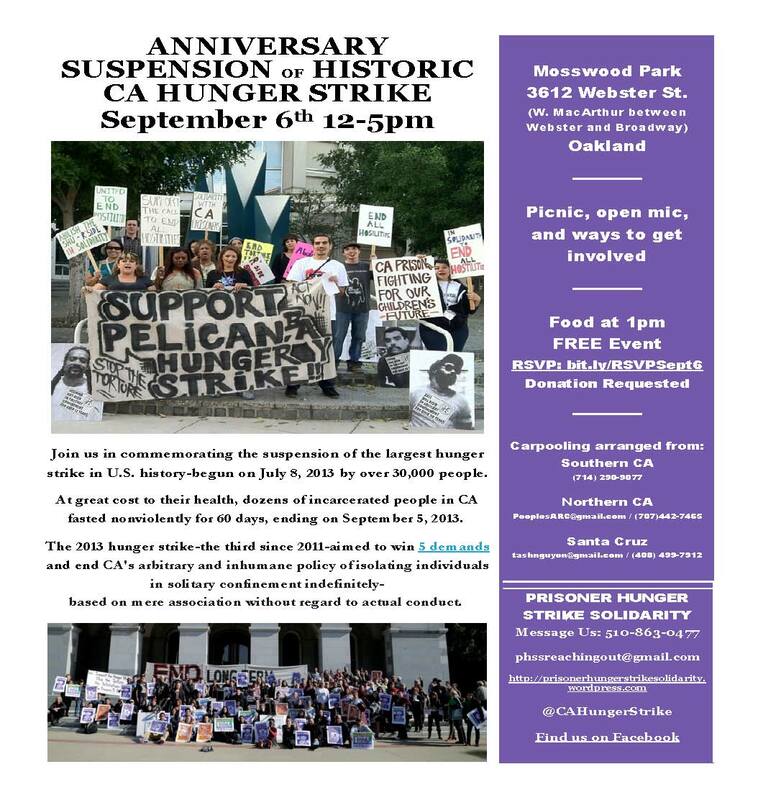 The 2013 hunger strike, the third since 2011, aimed to win five demands and end CA’s arbitrary and inhumane policy of isolating individuals in solitary confinement indefinitely – based on mere association without regard to actual conduct. 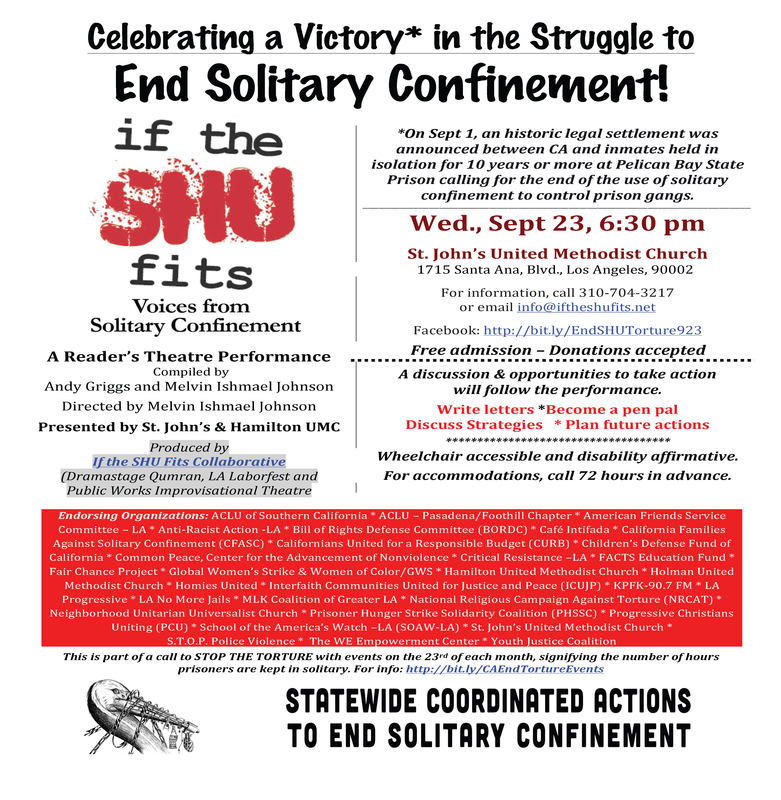 Join us as we honor these courageous people and push forward to bring an end to the torture of long-term solitary confinement.